Parking restriction signs went up on many of the roads at risk of tree felling before Christmas, with the restrictions from the 8th January onwards. In addition, there are very strong rumours from reliable sources that Amey have hired additional crews from across the UK for the whole of January to mount a felling blitz, similar to the one seen in May 2017. If true, and we have every reason to believe it is, then all of you reading this need to be on high alert. Quite simply, the “core campaigners” who are out on the streets every day of every week will be stretched incredibly thin to the point of not being able to defend some trees. Patrol the streets overnight to prevent hand sawing of branches. Park your cars under threatened trees. This is completely legal on roads without parking restrictions. And whilst not legal on roads with parking restrictions, so far, residents have been given warning requests to move their cars. So the process of moving cars away from a tree can buy time, allowing other campaigners to arrive. Contact other neighbours on your street and organise rotas to stand watch on your own street. This has proved incredibly effective on roads which have already done this. By being there already, when the felling crews arrive, people can sound an instant alert and then put themselves in place to “gecko.” This is the completely legal action of standing with your back to a wall underneath a tree that is about to be attacked, before the barriers are erected. Put up new (instructions here and here and utilise the existing bat boxes and other holes in trees. It is illegal to destroy a potential bat roost. Whilst felling crews may claim that the legally required endoscopic inspection by a bat expert has taken place, it often hasn’t. And the reality is that the inspection is supposed to happen in the minutes before felling, not days before. Amey are not telling the arborists on the road the truth. What you can do is challenge the arborists assertively about the fact they are about to break the law. This can be surprisingly effective as adding seeds of doubt into the arborists heads. Block the completion of a fully connected barrier. Gaps in barriers mean the barrier zone isn’t complete, which mean the injunctions can’t be enforced. It’s amazing what can be done completely legally to prevent the barrier zone from being completed, or to delay it. This includes standing on the concrete blocks that the metal barriers are inserted into, or simply milling around and getting in the way of the barrier crews, preventing them from taking barriers off the lorry. Every delay counts. Utilise the garden permissions (also know as oversail, trespassing legislation, see our campaign leaflets page). Most are still useful in terms of health and safety restrictions of felling overhead. But they are also vital in allowing “geckos” in and out, and fed with supplies. Film and photograph everything. Film incomplete safety zones, unsafe practice such as felling overhead. 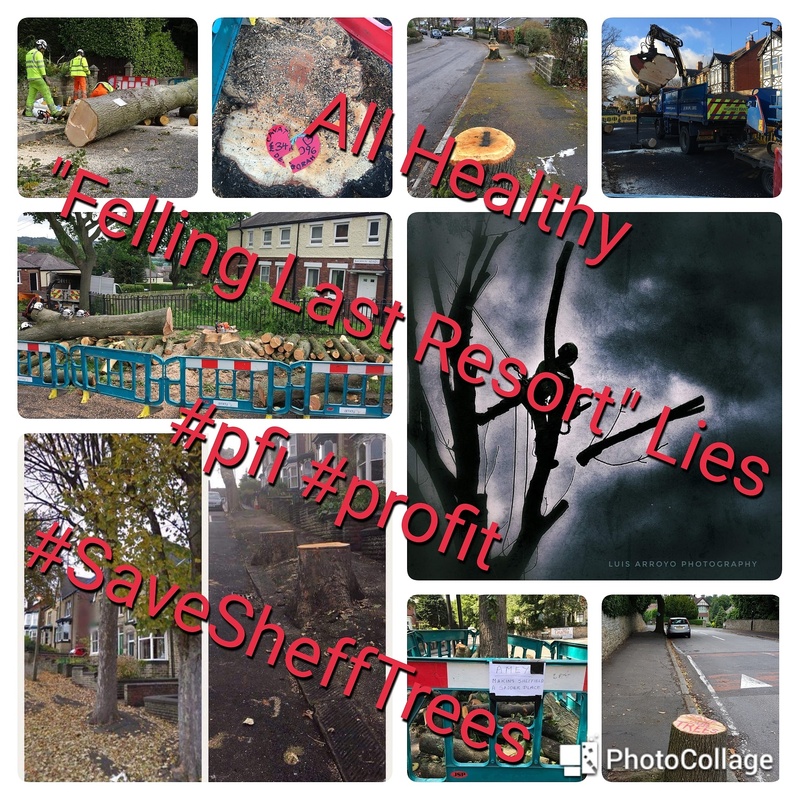 Film assault against campaigners by felling crews and security staff. Film everything. Challenge arborists and security staff about everything they do. Even if it’s just a 5% doubt, it’s a doubt. Which puts them under stress, and means they are more likely to make mistakes. For the avoidance of doubt, we are not encouraging you to do any of the above, just pointing out some of the tactics previously used successfully to defend trees. The most important thing from all the above is to not just assume that the “core supporters” will be around to defend “your” trees on “your road.” Stretched thin, it may be that even with alerts sent out, there may be nobody available to come to your street. If you want the guarantee of your trees being defended, it will require all of you reading this to step up and defend your own streets, as well as sending out alerts to anyone who may be available.